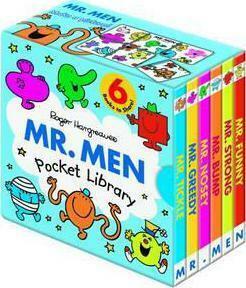 A fun-sized collection of six stories that let you join some of the favourite Mr Men. Including; Mr Funny, Mr Strong, Mr Bump, Mr Tickle, Mr Nosey and Mr Greedy! Roger Hargreaves is best remembered as the creator, author and illustrator of the Mr. Men and Little Miss. These hilarious tales with their bright, bold illustrations have been part of popular culture since the launch of the very first book, Mr. Tickle, in 1971. To date over 85 million copies have been sold worldwide and they have been translated into 20 languages.